The home you had in the Tudor times very much depended on how much wealth you had. This meant that the way the rich and poor lived in their homes was very different. What were the main differences between the houses the rich and poor lived in? What did the rich have that they poor did not? The rich lived in country mansions which were often designed to a symmetrical plan - E and H shapes were popular. Wealthy Tudor homes needed many rooms where large number of guests and servants could be accommodated, fed and entertained. Wealth was demonstrated by the extensive use of glass, hugely expensive luxury at the time. Glass was a fashionable novelty and became a status symbol. 'Look at me, I must be rich because my house has lots of glass'. Windows became the main features on many Tudor houses belonging to wealthy people. the difference between the houses are that the poor people had houses made out of straw wood and sticks.the rich people would have brick houses with stone window sills. there house wold be like a castle. also the poor peoples house would have a hole at the side of there house for windows.they would have wooden shutters to keep them warm.they had to sleep on straw beds or a mattress filled with straw to sleep on.they would only have one room where the whole family had to live and they had one box to put all their belongings in.Their houses were made out of straw and many other things, including and dung and mud. 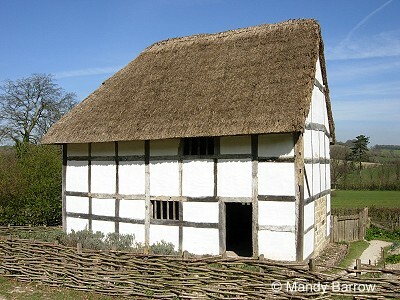 The houses were very simple.Their houses were made out of straw and many other things, including and dung and mud. The houses were very simple.They would have a couple of pots and pans. The furniture was normally a small wooden table and a little stall that they had made themselves. They would have a wooden bowl and spoon to eat with. The floor below them was not floor it was the earth.The water they had come from a stream or a river. The toilet was basic a hole in the ground. The rubbish would go in a field or bush. The longest they would live for is about 30 if you lived longer you were lucky. The children of poor people would not go to school because they had to work. There were a lot more poor people than rich.In the Middle Ages rich people's houses were designed for defense rather than comfort. In the 16th century life was safer so houses no longer had to be easy to defend. Rich Tudors built grand houses e.g. Cardinal Wolsey built Hampton Court Palace. Later the Countess of Shrewsbury built Hardwick Hall in Derbyshire.Chairs were more common than in the Middle Ages but they were still expensive. Even in an upper class home children and servants sat on stools.In wealthy Tudor houses the walls of rooms were lined with oak paneling to keep out drafts. People slept in four-poster beds hung with curtains to reduce drafts. In the 16th century some people had wallpaper but it was very expensive. Other wealthy people hung tapestries or painted cloths on their walls.In Tudor England carpets were a luxury only rich people could afford. Usually they were too expensive to put on the floor! Instead they were hung on the wall or over tables. People covered the floors with rushes, reeds or straw, which they strew with sweet smelling herbs.The rich also played board games like chess and backgammon (a backgammon set was found on the wreck of the Mary Rose. It is the same as a modern one). They also tennis with a leather ball stuffed with hair. They also played bowls and skittles. Playing cards were also popular. the diffrence between the poor and the rich is that there's no whole in the wall for the rich but not the poor the poor had a whole in the wall because they couldent there houses were made out of straw they would have wooden bowl and spoon to eat and the rich had what we have today in today. A Poor Tudor house would have a hole in the wall for a window; sometimes they would have wooden shutters to keep them warm. They had to sleep on straw beds or a mattress filled with straw and had small blankets to keep them warm. They would only have one room where the whole family had to live and they had one box to put all their belongings in. A Poor Tudor house would have a hole in the wall for a window; sometimes they would have wooden shutters to keep them warm. They had to sleep on Wealthy Tudors had clocks in their homes. The very rich had pocket watches although most people relied on pocket sundial. Rich Tudors were also fond of gardens. Many had mazes, fountains and topiary which were just hedges cut into shapes. The poor people have windows but they had to drill a hole to make a window and the rich Tudors dose not have to drill a hole they just have normal glass windows. Was Henry VIII the strongest king? Did you know that poor people had wooden wall's and a straw roof? The poor people had holes for windows whereas rich people had stained glass. Another fact is that this links to the Romans. Romans had brick walls and so do the Tudors. Last fact, Romans had stained glass and so did Tudors. have a hole in the wall. The Tudor houses are different to the houses we have today.The poor people would have a hole in their wall for a window and they would put shutters to stop the cold from entering.The rich Tudors would have arches over their entrance to show the poor that they were rich and the poor would have only one room so they would have to sleep in the same place that they bath/cook and sleep in the same room.some rich people would live in the countryside. houses.poor peoples houses were made out of animal dung ,clay,sticks,wood,twigs. Poor people dont even have windows they had holes with a wooden door.Rich people windows are made out of glass like from churches. Rich Tudor people had chimneys whereas the poor Tudor people didn't have one so instead they holes on the top of their homes.Poor Tudor people's house were made by themselves because they were poor and they used wood strips,sticks covered with clay and dung and at the end they painted their homes with white and black paint but rich Tudor people's house were already made by bricks.Rich Tudor people had windows that had pictures whereas poor Tudor people didn't have windows with pictures or windows.Poor Tudor people had to sleep in straw beds or mattress filled with straw and they had small blankets to keep them warm whereas rich Tudor people had really warm mattresses. did u know that poor Tudors have their houses are made out of wood and that's very dangerous because they always light fire in their house and if someone kicks it on the wall the house will burn down and it was also it was made of clay,dung and straw.the rich people lived in a big house and their houses are made of solid bricks , also some rich Tudors had half wooden roofs.The rich Tudors have an arch or an ally way to enter their house to show the poor people that they are really posh and worthy.Poor people only have one room which was the living room,dinning room,kitchen and bedroom,they also had a hole in the wall for a window and sometimes they put wooden shutters to stop cold air from coming in. Rich people had big houses for themselves.Rich people had proper windows that were made out of glass.poor people had small houses that had 1 room that had to last for everything. poor people had no windows only had holes. In year 4 red and blue we have been learning about the Tudors and we have been mostly have been learning about food and learning about food and houses.Most of the poor peoples houses are made out of animals waste and dirt.The poor people also had no arches because they could not afford to buy it.The poor people only could have one room in there house. The rich Tudors could afford every thing they want. In the Tudor times times the rich people used to have arches to show off there entrance and there building is made out of brick and wood inside some houses were very huge and has more than 432 rooms. In Tudor homes rich and poor there houses were made of mostly wood but in poor houses it was made of more wood [timber] whilst rich there houses were gigantic and consisted of mostly of brick or stone.Tudor houses were very good with architecture but they made this weird thing called a jetty.a jetty is when the first floor goes further than the ground floor but it is only with poor houses possibly rich country side houses for the wealthy. POP there comes the glass.